Due to the complexity of integration, this product is sold as a completely assembled system only (with minimum 2 CPUs, 2 DIMMs, 24 HDDs and 1 NIC or SIOM card). SuperStorage Top-Loading - Capacity maximized 45/60/90-bay storage systems optimized for software-defined data centers. Supermicro top-loading, capacity-maximized storage server family is ideal for use cases such as data replication, data backup, archive and cold storage, video streaming and surveillance, providing customers with more choices to deploy software-defined data centers. The new SuperStorage system comes with the industry’s most flexible design and features tiered storage packing hot, warm and cold storage in one compact 4U box. It’s the only 45-bay storage server supporting hot-swap NVMe SSDs (6 x U.2) for I/O intensive workloads, highest performance CPUs, up to 3TB of DDR4 memory, and a wide range on-board networking options with SIOM cards. Right-sized for every data center deployment with short depth (less than 26”), easy-to-deploy 45-bay, mainstream 60-bay and extremely dense 90-bay storage servers. Supermicro top-loading, capacity-maximized SuperStorage family is ideal to meet growing capacity challenges, with use cases such as object storage, data backup & replication, archive and cold storage, video streaming and surveillance. The complete offering of dense servers and JBOD enclosures provides customers with more choices to deploy massive capacity in a growing software-defined ecosystem. 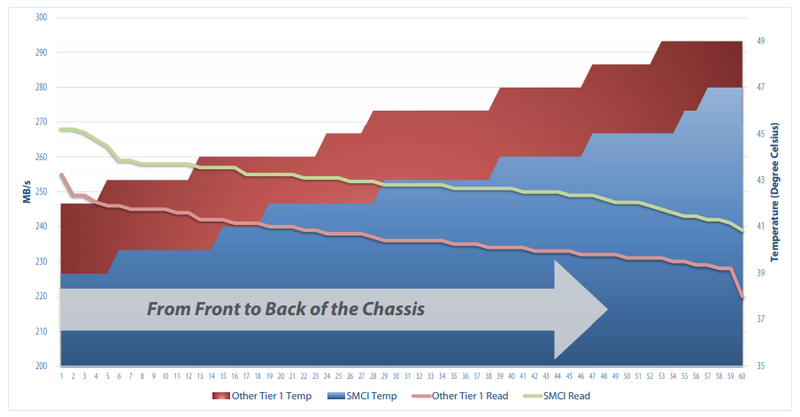 This paper details the design advantages of Supermicro’s top-loading SuperStorage family and how our density optimized system deliver the highest performance to support data intensive workloads. In addition offering usability features to improved operational efficiency for high capacity storage deployments. So how does one accommodate a tripling of demand for storage in existing facilities? The answer lies with dense devices packed in high density storage systems. The acquisition cost per GB of a 4U top-loading storage system is approximately 61% percent lower than a traditional 2U 12-bay system, providing a far more economical storage cost model. With similar system configurations (CPU, memory and etc), the toploading system provides an estimated 249GB per watt better power efficiency advantage, when compared to a traditional 2U 12-bay system. This represents around two and a half times more storage capacity per watt, reducing operating costs in data centers. Supermicro’s top-loading storage products are built on best-in-class 12GB/s SAS technology providing optimal performance for all SAS/SATA media including SSDs. 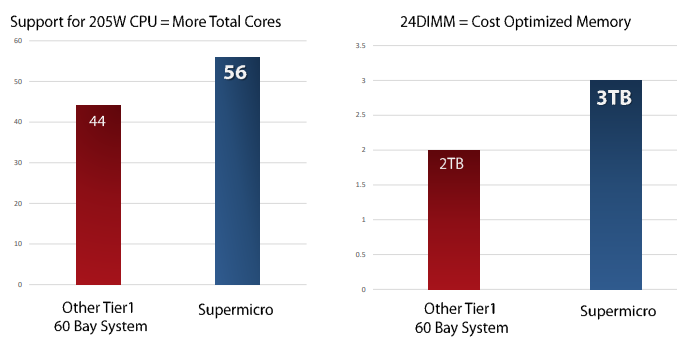 In a head-to-head benchmark with a competing 60-bay system, Supermicro’s robust design demonstrates aggregate performance advantages with the greatest flexibility in both media and CPU selection. 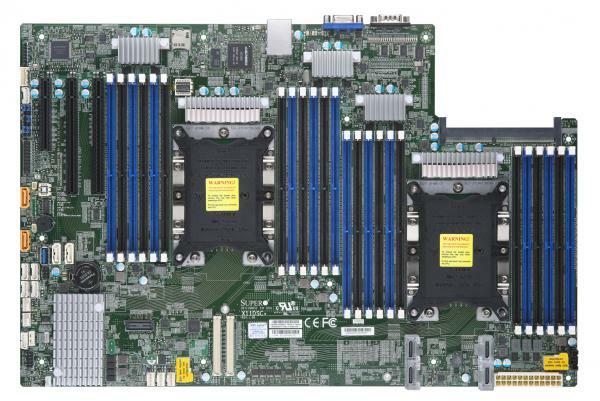 Supermicro leads the top-loading category with support for dual CPUs up to 205W each and up to 3TB of memory across 24 DIMM slots. While other Tier-1 vendors top-loading systems support limited archival applications the Supermicro Top-loading storage server offers the highest x86 specifications for both CPU and memory, making it an ideal platform for the latest software defined storage applications. Supermicro top-loading storage systems support up to the highest performance Intel Xeon Scalable processors with 205W TDP, providing the more cores at higher base frequencies to deliver optimal system performance for both throughput and IOP intensive workloads. With equivalent I/O bandwidth on both the frontend and backend, users get great performance from the start. This also enables advanced users the ability to configure the hardware and optimize their software to meet their application requirements. With 24 DIMM slots, users have most options for memory population, allowing up to 3TB of memory to be installed or the flexibility to populate with lower capacity DIMMs for the best value / TCO. Free floating drive bay design not only eliminate weight and vibration from the drives, it also improve system airflow, which allow lower fan speeds, lower noise, and lower power consumption. The optimized opening of the 3.5” drive bay structure provides the best air flow, allowing for efficient heat transfer to cool the drive. This structure also physically supports the media to reduce stress between the drive bays and the backplane, isolating each bay from the rotational vibration of its neighboring drive bay. One of the key server features is the support for up to six NVMe drives. NVMe can deliver a massive performance boost for IOP intensive operations. 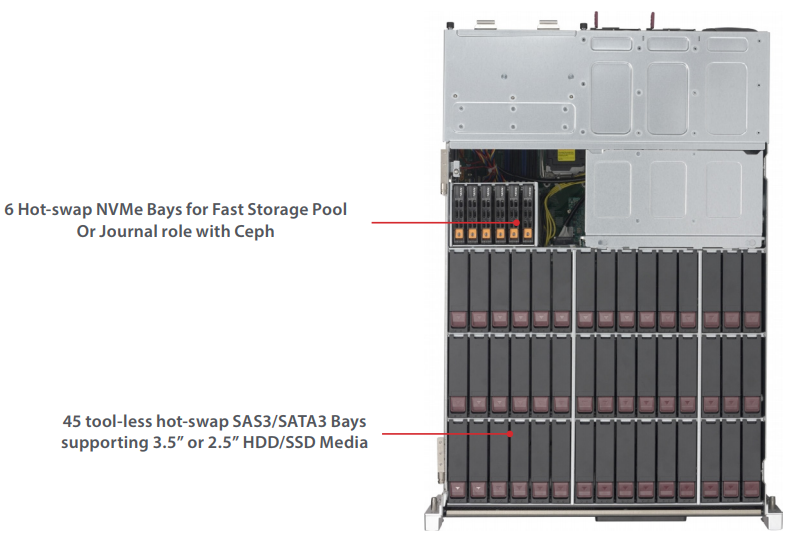 In application testing using the 45-Bay system with Ceph, we have found that 6x NVMe configured as a fast pool of storage, the NVMe pool has even greater performance than all 45 HDDs. By including NVMe in the design, the Supermicro top-loaders can meet a wider number of application requirements. 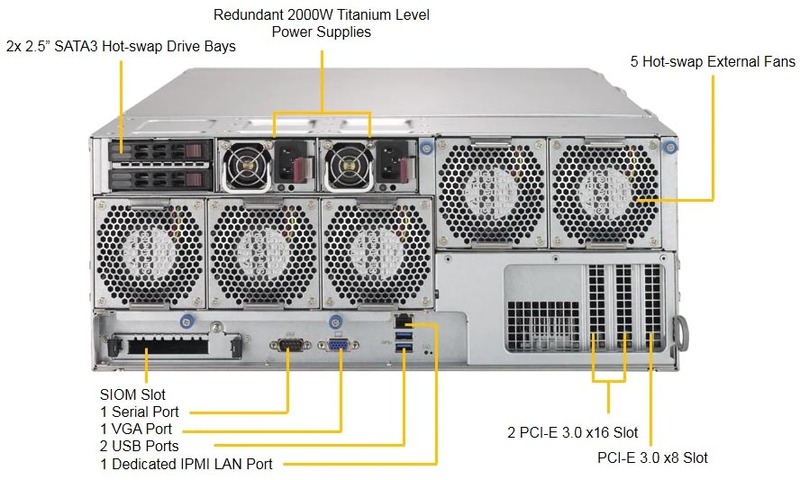 The popularity of the mainstream top-loading servers for large scale data centers inspired Supermicro designers to develop a top-loading server family that will fit in any server rack. The 45- and 60-bay servers offer identical server specification, including Dual Intel Xeon Scalable processors with up to 24 DIMM slots for powerful no-compromise compute performance. 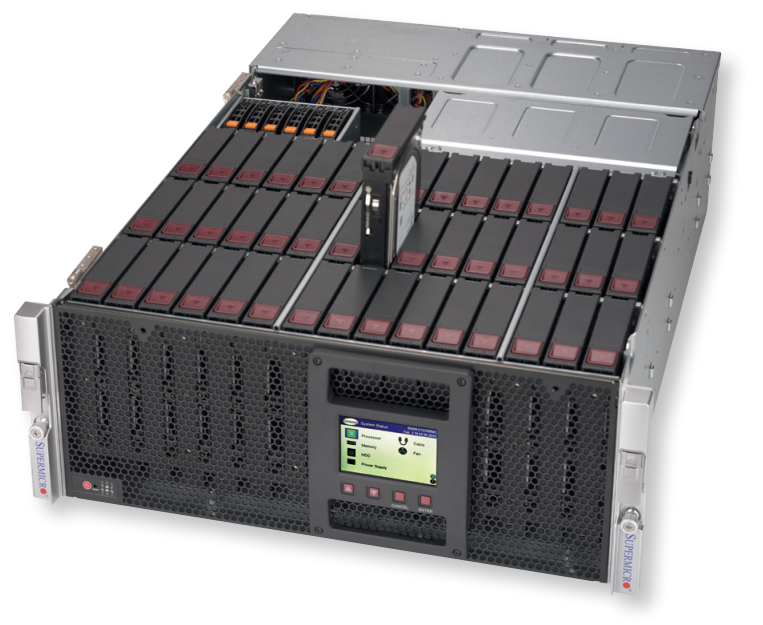 The 45-bay server is designed to fit in even the tighest co-location environments with only 26" chassis depth. A front-mounted LCD control panel gives the status of all critical components such as power supplies, disk drives, network connections, and environmental monitoring. This makes servicing any failed component much faster, as it can be quickly identified and addressed. Supermicro onboard SIOM offers flexible high performance networking up to 100GbE, Infiniband, OmniPath, and more while simultaneously saving a PCI-E slot for other add-on cards. Three PCI-E slots are provided; two with 16 lanes, and one with 8 lanes. This combination of processing power, large memory support, NVMe, and SIOM networking, coupled with the capacity of up to 60 drives, allows these storage servers to handle the most demanding applications. Five rear exhaust fans and two power supplies are provided for redundancy, and all are hot-swappable. The 4U top-loading storage enclosures provide JBOD expansion options with the latest SAS3 12Gb/s expander provided industry best available performance and storage density. 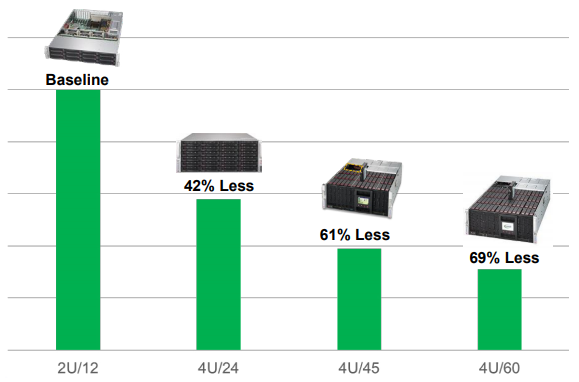 Storage expansion can lower overall TCO of storage deployments. These top-loading enclosures feature double-slide rails with cable management arm for easy access to the each drive bay without interrupting system power and network connectivity. With HDD LED indicators on each drive bay, user can easily locate bad drives and tool-less lock/ release clip make the swap of drive a breeze. Both SuperStorage systems and JBOD enclsoures can be easily managed via a dedicated IPMI interface with SNMP for remote system power on/off control and system monitoring such as backplane and power supply temperature, power supply health status, and fan speed monitor and control. Standard IPMI protocol allows users to manage multiple systems and JBOD enclosures with a single utility. The 45- and 60-bay short depth servers are the ultimate storage products for existing infrastructure or limited colocation facilities. 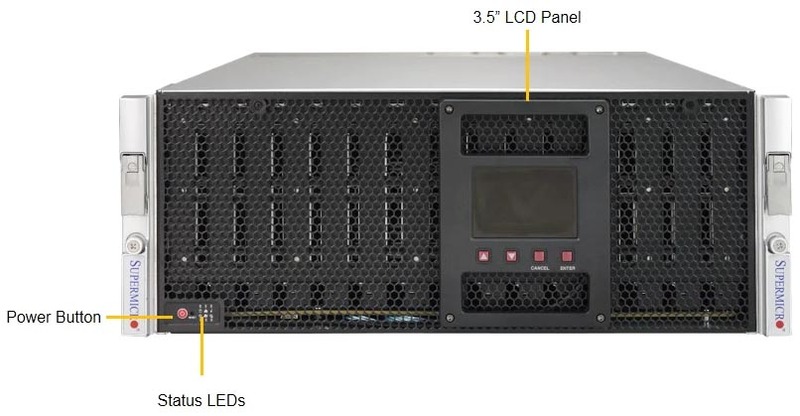 The 45-bay with its compact 26-inch depth makes it very easy to deploy in any rack environment. The server will fit in a standard 40” depth standard rack, even accounting for cable arms. This is substantially less depth than other top loading enclosures and even some of the most popular servers in the market place. This allows a more efficient utilization of space in the datacenter, reducing infrastructure costs. These storage servers are ideal for enterprise applications such as high capacity container and virtual server applications, HPC, and large scale-out object stores such as Ceph. Because of its feature rich Dual CPU/ 24DIMM main board as well as NVMe support it can handle the most demanding environments. At 4U rack space, Supermicro capacity maximized, top-loading family of storage systems are right-sized for every data center deployments with short-depth, easy to deploy 45 Bay, mainstream 60 bay and extreme density 90 bay. 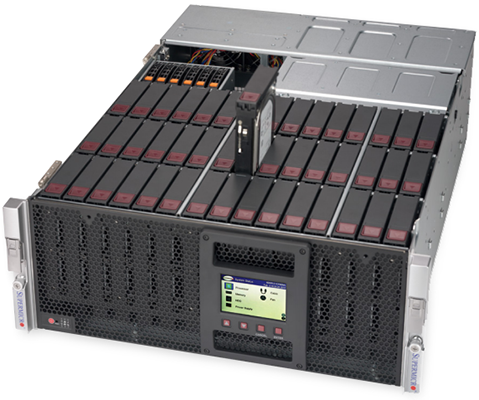 With 12 TB hard drives, the top loading storage family delivers over 10 PB capacity per rack.